Thanks to my involvement at the Product Review Place, I recently received a beautiful necklace to review from $hop 7. The necklace that I received from $hop 7 is a beautiful flower pendant on a silver chain. I really like this necklace- the pendant is full of beautiful colors and matches a great deal of my wardrobe. And the necklace has held up well to Vivian's attempts to rip it off my neck, which is always a bonus when buying jewelry! It's made of jasper stone and sealed in resin. I like the size and look of this pendant- it really makes my boring outfits look much more pulled together. Best of all, this necklace, and all the other jewelry on $hop7 is only $7. Another great product from the $hop 7 website- pretty earrings! I have a coupon code for you to use! And I have a giveaway. One lucky reader will get to win a piece of jewelry from Shop7! Open to worldwide mailing addresses. 3. 5 extra entries- Purchase something from $hop 7. Let me know what email address you used for the purchase so I can verify (and if you remember, put Growing a Baby Reviews in the comments box at checkout, so they know I sent you!). Giveaway will close at 9 PM on January 14, 2010. I'll choose a winner with random.org and will email that person, who will have 48 hours to respond. Good luck! Disclaimer: I was sent a necklace to try out for myself so I could write a personal review. I was not compensated in any other way and all opinions here are mine and mine alone. my favorite is the turquoise and gold bead earrings! I like Peacock 7 inch Beaded Bracelet. I love the Dale Earnhardt Jr Earrings. I'm following $hop 7 on Twitter as hybroanglid. I like the Oakland Raiders earrings! I follow your blog via Google Connect and email subscription! I love the Dale Earnhardt Jr Earrings~Beautiful!! 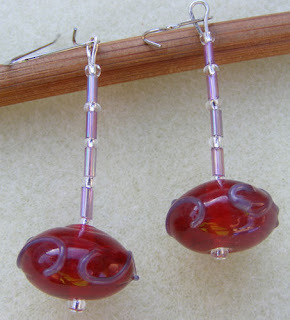 I also love the Purple and Copper Dainty Dangling Earrings~my favorite color!